Tuesday January 1, 1024 Was busy with some affairs of my own in AM. We went down town soon after dinner. Miss C--- left the car at her home. Mrs Falk and I to a picture show. Came out for Mr Falk so we took supper in town and later went to a musical recital. Wednesday January 2nd 1924 We went down town rather early in afternoon. I spent some time at Pickens. We came home for supper but went back to Science meeting in their new hall. I wrote to Nellie. weather fine. 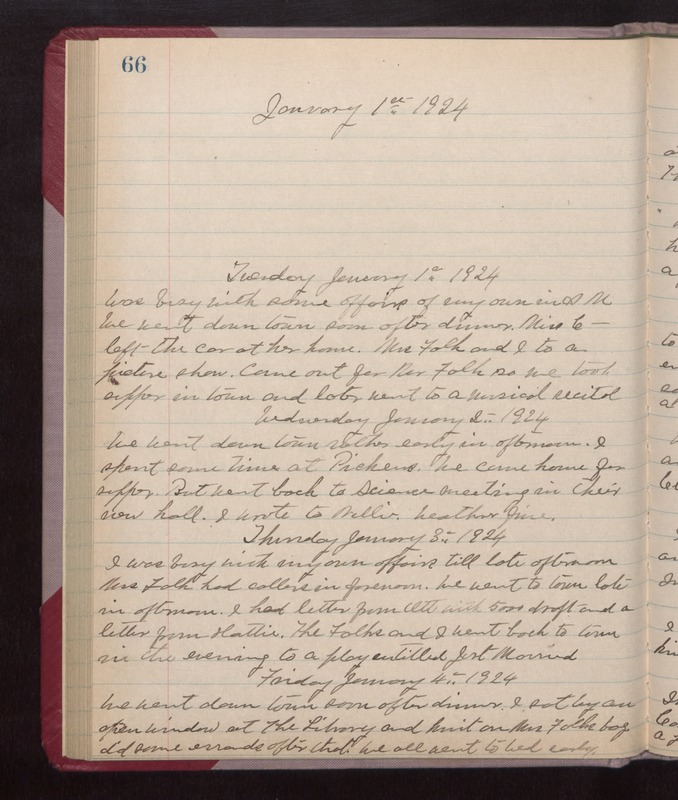 Thursday January 3rd 1924 I was busy with my own affairs till late afternoon. Mrs Falk had callers in forenoon. We went to town late in afternoon. I had letter from Ott with 50.00 draft and a letter from Hattie. The Falks and I went back to town in the evening to a play entitled "Just Married." Friday January 4th 1924 We went down town soon after dinner. I sat by an open window at the Library and knit on Mrs Falks bag, did some errands after that. We all went to bed early.